Designed primary for mid- to large-sized companies whose mission involves transportation and/or storage of freight/materials. Includes up to 10 individuals assigned to the membership. Any individual involved in marketing, sales, and/or communication for an organization whose mission involves transportation and/or storage of freight/materials. This package is designed especially for small- to mid-sized companies with few marketing or sales professionals on staff. Any person or company involved in supplying products or services supportive of marketing, sales or communications executives within transportation or logistics. 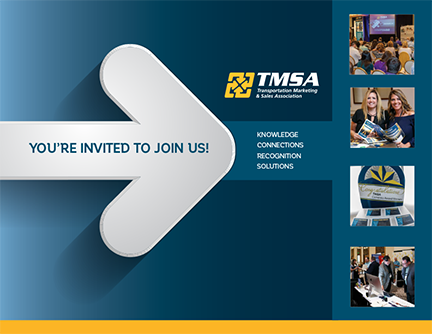 Includes up to 10 individuals assigned to the membership, discounted exhibitor packages and conference registration fees, access to the TMSA Online Membership Directory, and corporate profiles in the conference program and online TMSA Resource Guide.